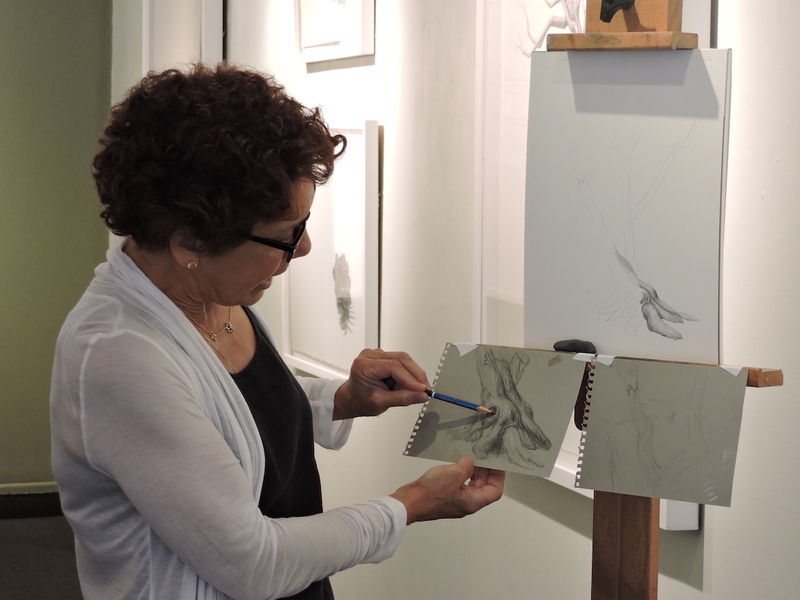 Yesterday, artist member Lucy Kalian held an artist demonstration to coincide with her solo show “Witnesses.” Inspired by a nearby tree on Agassiz Road, Kalian created an original graphite drawing of the tree while sharing fascinating tips and techniques. Using graphite pencils, Stonehenge paper, and sketches for reference, Kalian drew a real-life tree she found near The Fens. After examining the tree’s roots and branches in separate sketches, Lucy brought the two pieces together into one uniform drawing. To determine the scale and ratio of her still lifes, Kalian uses her pencil to judge the height and width of the figure. Paying such close attention to detail, her larger drawings will often take several days to complete. Therefore, in order to ensure that her measurements stay the same, Kalian will put a tape on the ground to mark her distance. Rather than drawing an exact photographic copy of her studies, Lucy exaggerates some of their features. By doing so, Lucy can spend more time drawing out the emotional aspects of her piece. For example, part of Lucy’s style is to exaggerate the values of a tree trunk where it meets the earth. This way, the tree has a better sense of weight, grounding, and stability. After establishing her values, Lucy will define the details that give each tree its character, such as bark. To draw bark believably, one must consider how the bark wraps around the tree and how the rough surface interacts with light. In picking figures to draw, Lucy finds subjects with distinctive traits, or ones with which she has an emotional connection. The black willow tree on Agassiz Road caught Lucy’s attention because of its intriguingly tangled roots. While her “Witnesses” series features numerous types of trees, Kalian admits that she will spend several weeks on one species at a time until she believes that she “understands them” and can draw them believably. You can see more of Lucy Kalian’s graphite drawings in her solo show “Witnesses,” on view in the Upper Gallery and the Back Bay Room through June 17th.